Mastering English prepositions can be challenging. Yet these little words pop up everywhere when we speak and write, so we have to learn how to use them! Three of the most common prepositions of time – at, on, and in – follow certain basic rules. You can remember them more easily with the help of this AT, ON, IN triangle. Like the top of a triangle, AT refers to a very narrow, specific time, such as 4:30 or 7:00 o’clock. Like the middle of a triangle, ON refers to a slightly broader time, of one day or one date, such as Sunday or May 22. Like the base of a triangle, IN refers to the widest time period, such as a month, a year, a season, a decade, and so on. A summary of these rules, along with several commonly used exceptions and expressions, is given in the table below. 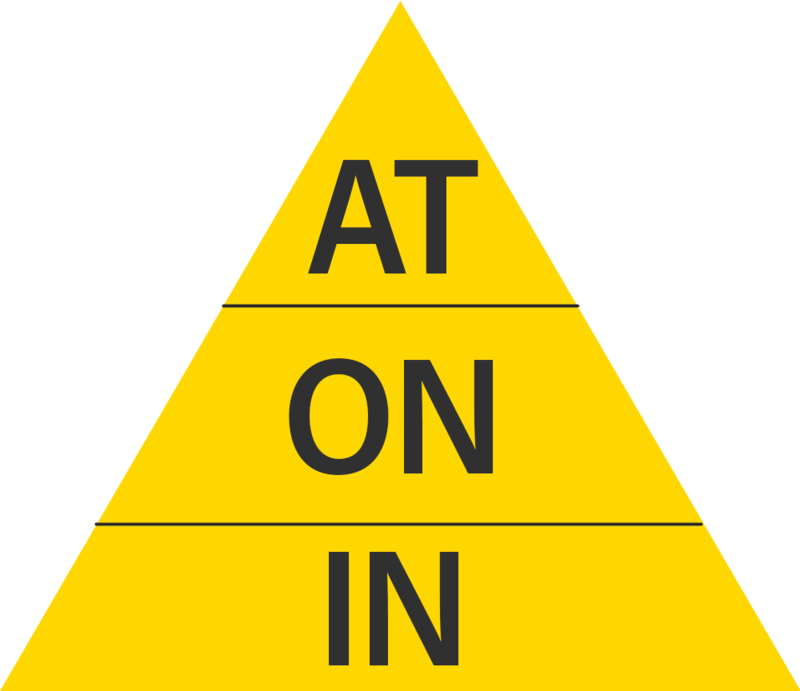 Watch Rebecca’s EngVid lesson video, “Master AT, ON, IN with the TRIANGLE method” to get a full explanation of the triangle and to learn how to use these prepositions. Keep practicing until the right words come to you easily and quickly. specific time at 5:00 See you at 5:00! at 12:30 The meeting starts at 12:30.
at noon We serve lunch at noon. at midnight I’ll be asleep at midnight! (expressions) at the moment She’s busy at the moment. at the same time Both flights arrived at the same time. at this time We have no positions available at this time. at that time At that time, they were in Rome. at some point At some point, he’ll complete his PhD. at any time Don’t call my cell at any time. at sunrise The air is so clean at sunrise. at sunset I love walking by the beach at sunset. at lunchtime The café was crowded at lunchtime. at dinnertime We’ll talk about it at dinnertime. at suppertime The kids will be back home at suppertime. at night By the way, Jack called at night. one day on Monday The concert is on Friday. one date on Jan 5th I’m seeing my dentist on May 10th. repetitive days Tuesdays My yoga class is on Tuesdays. on Independence Day I love watching the fireworks on Independence Day! on your birthday What did you do on your birthday? on their anniversary He gave her a gold necklace on their anniversary. one day + time of day on Monday morning Do we have a class on Monday morning? on Tuesday afternoon We last spoke on Tuesday afternoon. on Friday evening On Friday evening, we usually go out for dinner. on Thursday night Where did you go on Thursday night? (expressions) on time We made it to the exam on time. on the dot The organizers started the conference on the dot. on the hour The clock chimes on the hour. months in July They’re getting married in July. in the summer The kids love playing outside in summer. We go camping in the summer. years in 2005 They moved to London in 2005.
centuries in the 1700s Alaska was discovered in the 1700s. long periods in the Middle Ages The printing press was invented in the Middle Ages. (expressions) in the past In the past, I used to drive to work. in the future In the future, I’ll buy a house. in a few days She’ll be back in a few days. in five minutes He’s going to call back in five minutes. in the morning I woke up early in the morning. in the afternoon Does she sleep in the afternoon? in the evening I’m going to the library in the evening. last Last Friday, we were in London. next I have a doctor’s appointment next week. this He’s coming over this Thursday. every We watch TV every night. today Today is a brand new day. tomorrow Sorry, I can’t meet you tomorrow. the day before yesterday She was in the hospital the day before yesterday. the day after tomorrow We’re flying to Mexico the day after tomorrow. recently Recently, my eyes have been bothering me. nowadays Nowadays, he’s kind of depressed. as we speak They’re getting married, as we speak! long ago I knew someone like that long ago. a week ago We signed the deal a week ago. a year from now I’m not sure where I’ll be a year from now. The movie starts __________ 19:00. My parents are arriving__________ Thursday. Bob and Susan are getting married __________ June 10. We're supposed to be paid __________ Friday evening. I think the mall closes __________ 21:00. My son loves to go up to the cottage __________ the summer. I graduated from university __________ 2005. Can you meet me __________ Sunday? The seminar will begin __________ exactly 8:30. All my children's birthdays are __________ April!